Isn’t it nice being confronted with pop art spread all over in NYC? Yes, it is!!! 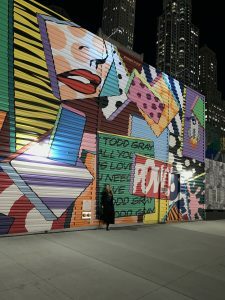 Todd Gray is actually involved in the 2 World Trade Center art project which you can’t miss.He is a modern day contemporary pop up artist and uses images like cartoons, superheroes, hashtags, social media, emojis etc. from the past and is trying to interface recognizable imagery.